We are honored that for the third year in a row we have been bestowed with a Community Connection Grant from the great people of Wells Fargo. 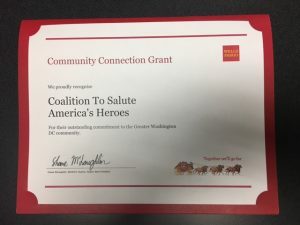 The Wells Fargo location in Leesburg, Virginia was the one who recognized the Coalition to Salute America’s Heroes as a non-profit of choice by their bank staff for the excellent work we do. Special thank you to Lan Bui the branch manager at the location who chose us. Overall Wells Fargo does amazing things with regards to the support of charities like us. 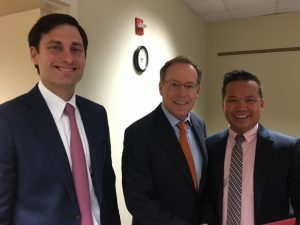 They donate $3.3 million annually, to non profit organizations throughout the country through their Community Connection program. In past years they’ve donated over $281 million to non profits and schools; 2nd highest among U.S. corporations.